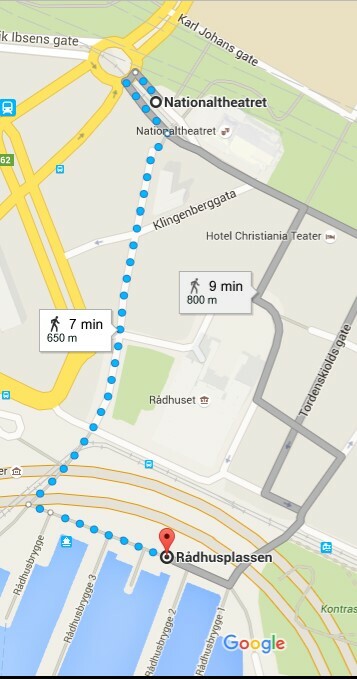 If you travel by public transportation we reccomend getting of at either the National Theatre og Oslo Sentral Station and walk from there. The National Theatre is the stop closest to the arena. Find more information on how to get to the arena bellow. There are both trams, trains and busses stopping at the National Theatre. Please find more information about all routes on Ruter.no (Train/Bus/Tram). Walking from the National Theatre to the BMW Oslo Maraton Arena on Rådhusplassen will take approximately 7 minutes. The Start and finish will be at the end of Olav Vs street, near the Expo. There are both trams, trains and busses stopping at Oslo Central Station. Please find more information about all routes on Ruter.no (Train/Bus/Tram). The Fastest way to get from the Central Station to the BMW Oslo Marathon Arena is by walking up “Karl Johans Gate” and go left onto “Rosenkrantz’gate” by The Parliament and follow this street until you see the Expo (a big white tent). You will receive your entry card to your registered email address in the week leading up to race day. You will also receive this on SMS to your registered number. If you enter in the week leading up to the event the entry card will be sent directly after registration. The bib number will be available for collection in the Expo tent at “Rådhusplassen”. We advise you to collect your race number on Thursday or Friday to avoid long waiting lines. If you plan to pick up your bib number on Saturday, please be advised to arrive early, and in good time for your start. Entry card, which you will receive by registerred SMS and email. To pick up a race number on behalf of someone else, you will need their entry card and a copy of their ID. If you register before the 26st of August you get your name on your bib number. If you registert after this date, or deside to change your race distance you will not get your name on your bib number. When you make your entry you can choose to add our BMW Oslo Marathon T-shirt. The T-shirt has an additional cost of 100 NOK. If you have purchased a t-shirt, you will be able to collect this in the Expo tent when you pick up your bib number and luggage bag. You can also get the t-shirt in the Expo tent, but there is no guarantee for available sizes. You can make your entry online up until the race day. It is also possible to make an entry and/or change your race distance at the information desk in the Expo tent at Rådhusplassen. All race distances are subject to be fully booked, and we reccomend early entries so secure your place on the start line. If you want to change your registered distance, please contact us at [email protected]. Participants who want to sell their ticket can do this by logging on to “My Page” at the registration page here. If you transfer your registration, you will receive a voucher which can be used as payment by another person. The discount will equal a new registration, and a fee of 100 NOK for the name change, which will be subtracted from the discount. The voucher is only valid for the same distance that the seller was registered for. We have four price levels for each distance. Bellow you will find the different distances and dates for each level. All purchases are binding and non-refundable in accordance to the Norwegian consumer protection laws. BMW Oslo Marathon offers entry for NOK 100,- to all disabled and wheelchair participants. Press here to get to the sartlist for 2019. Which group you start in depends on the time you register as your “estimated time” in your entry. You can change your estimated time in your profile on “my Page”. The start and group times for 2019 will be published closer to the event. Bellow you will find the times from the event in 2018. It is likely that this will be similar to the times in 2018, but they are also subject to change. The BMW Oslo Marathon Expo will be situated in a big white tent near the start-/finish line on Rådhusplassen in the Oslo City centre. Here you will find the bib number pick up and you can collect your luggage bag and/or t-shirt. The Expo also contains exihibitors from various sports and health brands and organizations, in addition to BMW Oslo Marathons partners. Check it out, and paritciapte in fun competitions, get useful information and good offers on great gear. Click here for more information about Expo. You may check your BMW Oslo Marathon luggage bag for storage during the race. The Luggage Storage area is situated close by the start area; in the City Hall backyard (Fridjof Nansen Square). For safety reasons, you will only be able to check your BMW Oslo Marathon luggage bag for storage. You will not be able to store other sorts of luggage, suitcases or bags in the storage area. We thank you for your understanding and respect for our guidelines for safety. If you want to store other types of luggage, we recommend using the storage facilities at the Oslo Central Station or similar. Collect your bib number and BMW Oslo Marathon luggage bag at the Expo. In the envelope with your bib number you will find a tag with your name and number – attach this tag to your luggage bag. To retrieve your bag, you will need to present your race number – remember to not throw it away before you have collected your bag! The area for luggage storage will be outside, and any stored items will be stored at your own risk. We do not recommend leaving behind valuables. We also recommend bringing a plastic bag to cover your pack to avoid it getting wet. There will be security present, but BMW Oslo Marathon will not take responsibility for damage or loss of any items. Please note that any unclaimed items left behind in the luggage storage will be donated to charity. Please be advised to arrive early, as there may be some queues. We have multiple toilets placed on the arena. The majority will be placed near the group lineup is, in Rosenkrantz’gate. We reccomend using these toliets to avoid long queues. There will also be some toliets near Kontraskjæret, and some toilets near the ceremony stage. Toilet adapted for wheelchairs is located near the ceremony stage. At the fluid stations you will also find toilets placed before or after each station. Volvat Medical Centre and Norwegian People’s Aid will provide healthcare in their main tent by the finish line and along the running course. Medical teams from Volvat have extensive experience with emergency treatment. All personnel will have experience within medicine and science in sports. As requested by the police, we do not allow running with headphones or running with strollers in the running course due to safety reasons. Make sure to get enough food and drinks throughout the day. All participants of the BMW Oslo Marathon will receive a medal after finishing. The top three contestants in each distance will be invited to the stage to receive their awards. They will be informed by our personell when and where to meet up. The award ceremonies will be held at the stage on Rådhusplassen, near the finish Line. All age class winners will receive their prizes in the tent behind the stage. Please check the finishers lists to see if you are one of the winners. Download the app UltimateLIVE! Here you can choose runners that you want to follow and see their position in the course during the race! Utlimate Sport Service take your picture when you cross the finish line. Smile to the camera when you cross. They also takes pictures at some of the time stations. You can find all pcitures when you check your results. We also have other photographers around the running course and the arena taking pictures and capturing moments. The BMW Oslo Maraton is broadcasted directly on the Norwegian TV-channel NRK1. We offer team entries for companies, organisations and large groups. Your company can register your teams on our entry page. If your team has more than 10 contestants you can earn a discount. The more contestants you have the higher the discount. And you can choose individual payments or payment by invoice. Find more information about team entries HERE. On race day you can offer your team contestants a team tent in our tent village. The tent can be used as a gathering point, we offer food and drinks and more. Find more information about the tent village HERE.